My husband loves gadgets like iPhones and Apple products, so we all have iPhones and recent Mac releases. One thing that I have always admired is my husband’s ability to keep all of his “babies” looking just like they came right out of the box. You won’t find even a speck of dust on his monitor or a fingerprint on his iPhone, especially now with the help of Cloth Addiction. 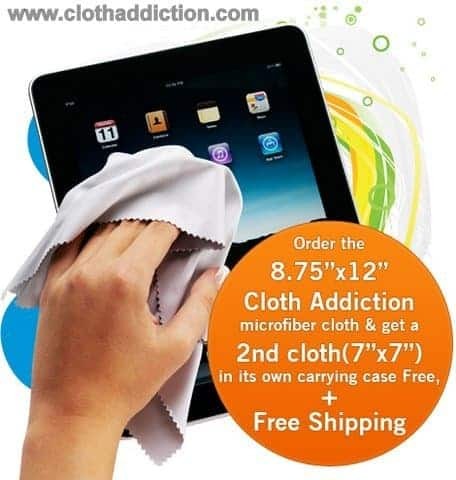 Cloth Addiction specializes in 100% microfiber cleaning cloths for your gadget cleaning needs. I couldn’t believe how soft the cloth when I rubbed it between my fingertips. I gave one of the two cloths we were sent to my husband and hung on to one for myself. My husband reported back to me that he was really pleased with the cloth’s performance. I tested out my cleaning cloth on my MacBook Air’s screen. Since I use my MacBook for hours on each day, it seems like I need to clean it constantly. The Cloth Addiction microfiber cloth is gentle on my screen and requires little pressure to wipe away even the most stubborn of fingerprints and dust patches. My iPhone is always filthy looking, and it shone once I was done cleaning it off with the Cloth Addiction product. This cloth’s performance certainly exceeded my expectations! No scratches on my screens, and no threads left behind after use. Everyone with an iPad, laptop, computer, or even a TV should really have one of these cloths! There is just no comparison. My daughter’s VTech toy came with a cloth to clean her screen, and the material is really rough and not very good at getting off dust particles or fingerprints without applying more pressure than should be necessary. Shame on VTech for using a less than spectacular cloth that can potentially scratch or damage an expensive toy! Cloth Addiction cloths are available in 2 sizes: 8.75” X 12” and a 7” X 7”. Both cloths are available from Cloth Addiction’s website for $8.95 plus free shipping and a complimentary carrying case for your 7” X 7” cloth. Your gadgets love you, so love them back and give them the royal treatment with this quality product. Order one today! I learned that this cloth will not scratch the surface of my I-Pad. I voted for Simply Stacie on Picket Fence Blogs. I learned it will not scratch my electronics. Super fine microfiber threads keeps your iPad and all other screens in optimal condition.